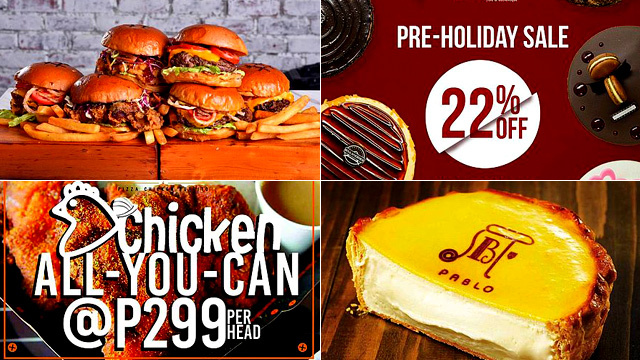 (SPOT.ph) Get your Halloween and long weekend plans sorted with these steals and deals! This week, we've found half-the-price halo-halo, unlimited wings, buy-one-get-one cheese tarts, and more. Also, don't forget to mark your calendars for Pound's new store opening treat. 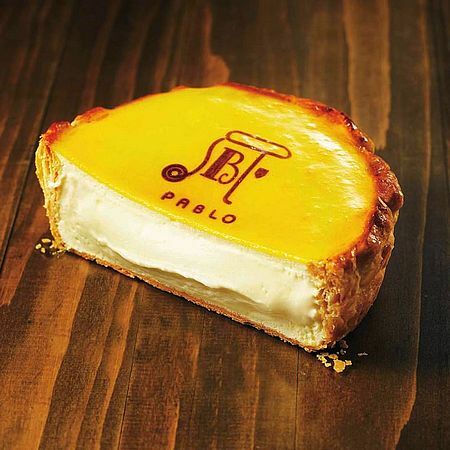 You now have more chances to take advantage of PABLO’s buy-one-get-one promo for the Chocolate and Matcha Cheese Tarts. 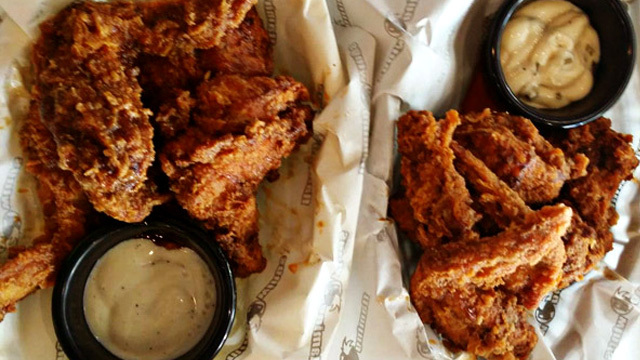 You can enjoy two of these heavenly treats until October 31. Be the star of Halloween when you bring everyone's favorites! 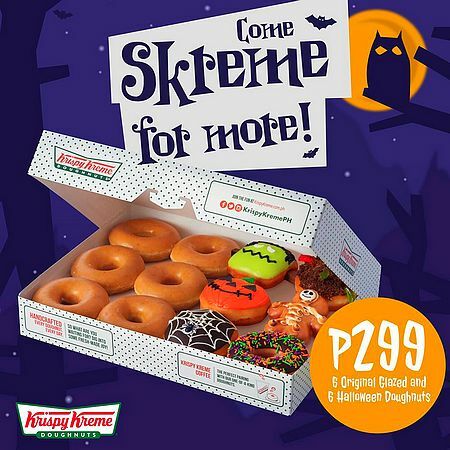 Share the spooky fun with six Halloween Doughnuts and six Original Glazed Doughnuts for just P299. Promo runs until November 1 only. 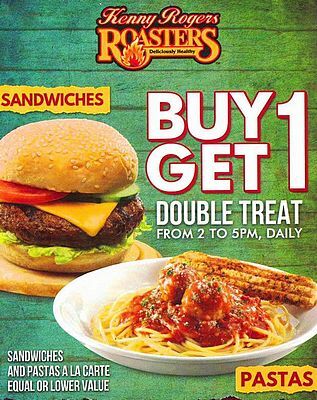 Get twice the a la carte sandwich or pasta that you’ll order from Kenny Rogers. All you have to do is present this flyer to avail your freebie. This promo is available until November 9 at Kenny Rogers’ 30th Ayala Mall branch only. Kenny Rogers is at LG/F Ayala Malls The 30th, 30 Meralco Avenue, Ortigas, Pasig City. For more information, log on to Kenny Rogers' Facebook page. 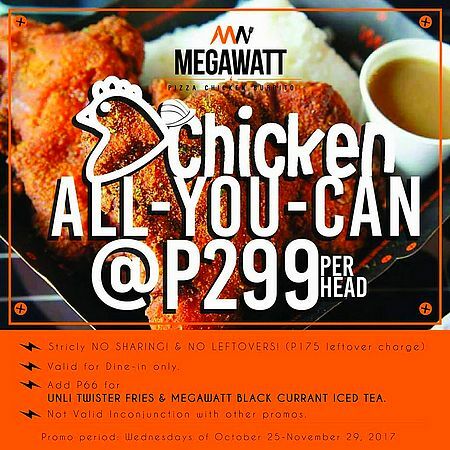 It's time to work up a big appetite because Megawatt’s biggest promo is back! For just P299, dig into all the chicken that you can, or add P66 if you want it with unlimited twister fries and black currant house-brew iced tea. This promo is available every Wednesday until November 29. Kuya J just hit a milestone! Celebrate its 100 stores with the sweetest promo! 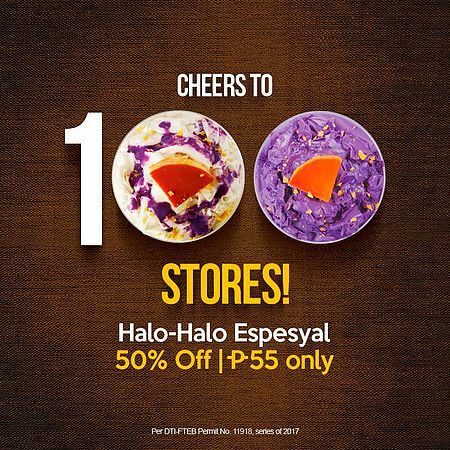 Get your favorite Original and Ube Halo-Halo Espesyal for only P55 each. That’s 50% off from its original price. Promo is available until October 31, from 2 p.m. to 5 p.m. only. See a list of Kuya J branches. For more information, log on to Kuya J’s Facebook page. Get into the mood for holiday eats with Boulangerie22! 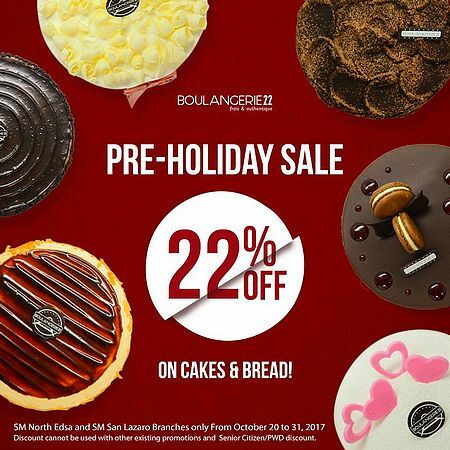 Stop by the SM North EDSA and SM San Lazaro branches and get 22% off on your favorite cakes and bread items. Promo runs until October 31. Boulangerie22 is at 2/F SM San Lazaro, North Wing, Sta. 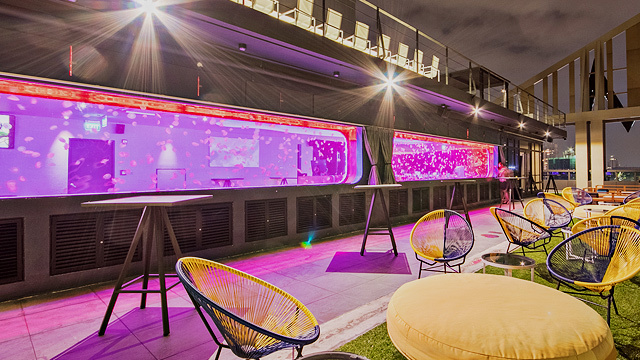 Cruz, Manila; and 3/F Main Building, SM City North EDSA, Quezon City. For more information, log on to Boulangerie22' Facebook page. Join Pound in celebrating the opening of its Robinsons Place Manila branch on November 3. Grab your favorite burger and pay what you want for it. You read that right! This one-day-only promo is valid for all burgers and sliders, except for Pound Foie Gras Burger, and applies to the first 50 customers on November 3. Pound is at G/F Robinsons Place Manila, Ermita, Manila. For more information, log on to Todd English's Facebook page. 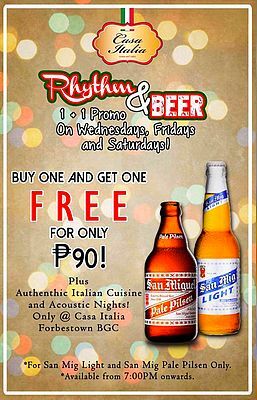 It's acoustic night at Casa Italia, where you can get two-for-one beer for just P90. This buy-one-get-one promo is valid on Wednesdays, Fridays, and Saturdays. Casa Italia is at Forbes Town Center, Forbestown Road. For more information, log on to Casa Italia's Facebook page. 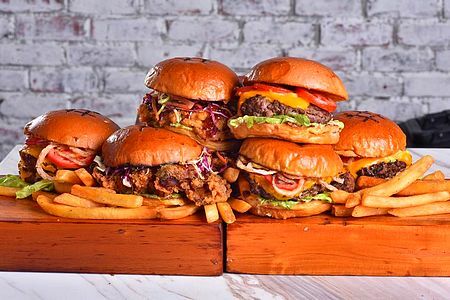 There's a big burger promo happening over at TGI Fridays. 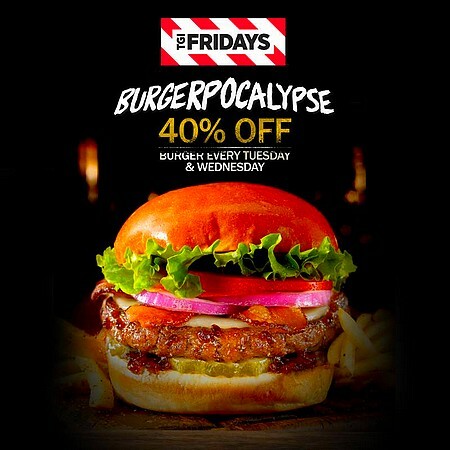 Get 40% off on all burgers at TGI Fridays every Tuesday and Wednesday until November 1. Burger lovers, you know where to go. See a list of participating TGI Fridays branches. For more information, log on to TGI Fridays' Facebook page. 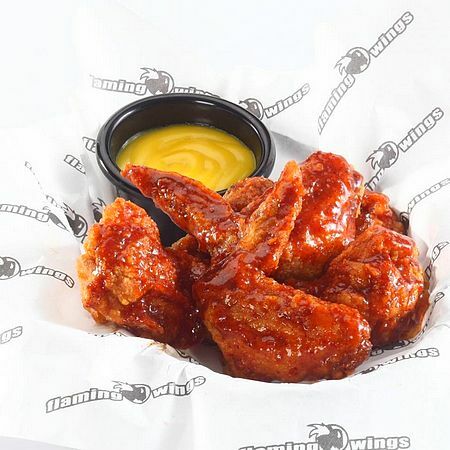 Get unlimited wings, pasta, and rice, and bottomless drinks for just P350 at Flaming Wings. The promo is happening on October 29 at the Taft branch and October 30 at the Katipunan and BF Homes branches.